It’s the first Wednesday of the month and time to celebrate those wild things who live in, visit, and NEED your garden! Welcome to Wildlife Wednesday for February. I’m still enjoying my backyard birds for Cornell Lab, but didn’t want to bore with the usual suspects from last month, though I have witnessed a Sharp-shinned Hawk, Accipiter striatus, visit a couple of times, no doubt looking for a tasty bird meal. I was too excited to grab the camera, so there are no pics of that gorgeous raptor staring hungrily at the White-winged Doves. …or not, I thought I’d share a project that Bee Daddy and I undertook this past year. 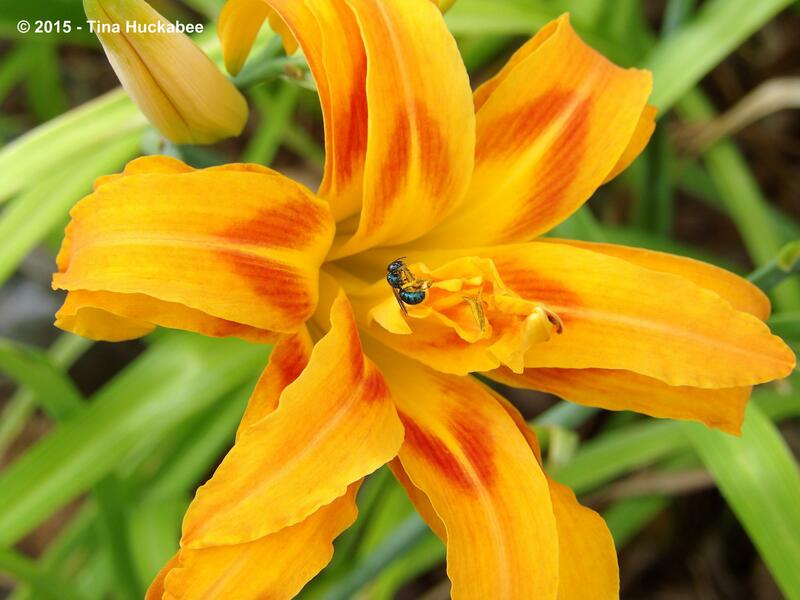 It’s not related to our honeybees this time ’round, but to our beautiful native bee residents. I’ve long left well-aged wood in my gardens so that bees can make a home for their offspring. It’s easy to do: leave wood out in the garden for bees to find. 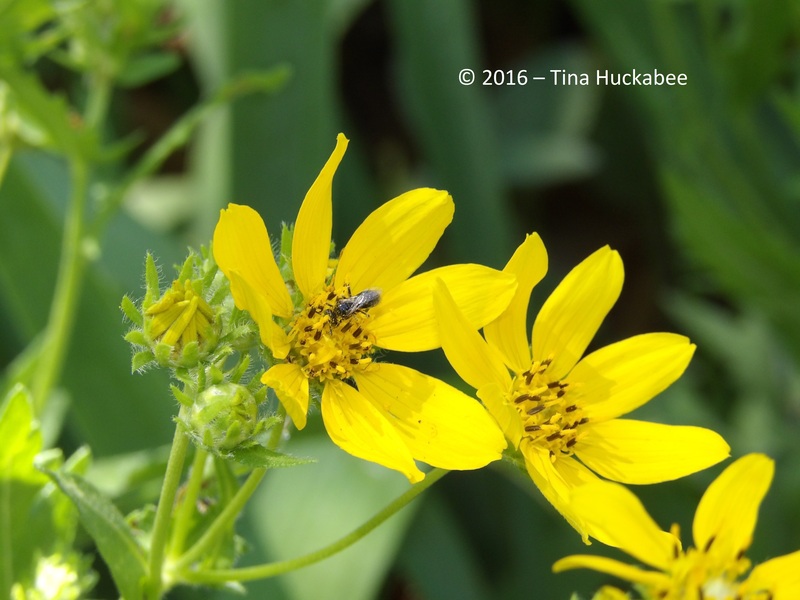 …more native bees are made. I do so love my honeybees. But the fact is that honeys are lazy pollinators and if you want bees with pollinating pow-wow, you need to attract whatever bees are native to your area of our little planet. Native bees are the best pollinators around. They pollinate food sources (one in three or four bites of food, depending upon your reading source) and approximately 90% of native plants are pollinated by native bees. Native bees are vital for the health of the world. According to the US Geological Survey, there are roughly 20,000 native bee species in the world, about 4,000 of which live in the U.S. They do not suffer the many maladies of honeybees, but we know that they are declining. The decline comes primarily because of human encroachment on natural areas, the move away from using native plants in home and commercial landscapes, and pesticide use. Additionally, native bees nest in wood and in open ground–all places and things that most folks rush to scrap in their home gardens. The sterile, pristine landscape paradigm is not kind to wildlife–of any sort–but it’s especially unkind to native bees. Wild bees need wild space. 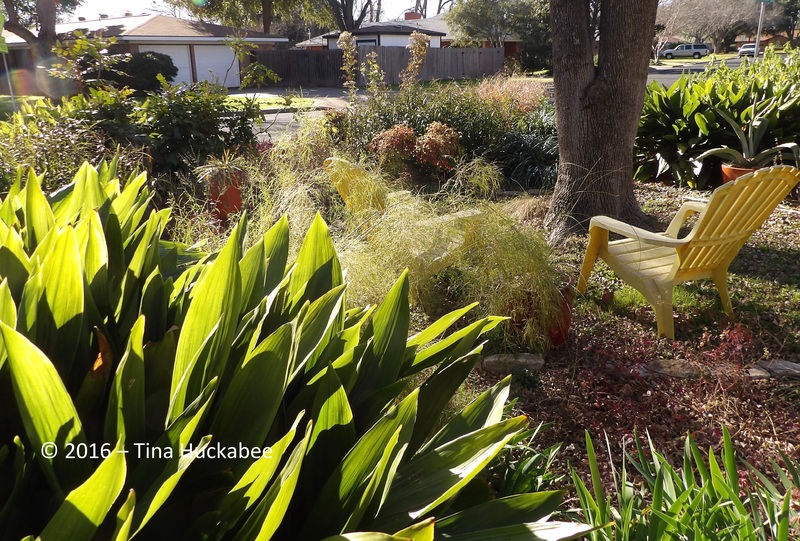 There’s not much we can do about urbanization, but gardeners can easily make our home landscapes amenable and attractive for these incredibly valuable and fascinating insects. 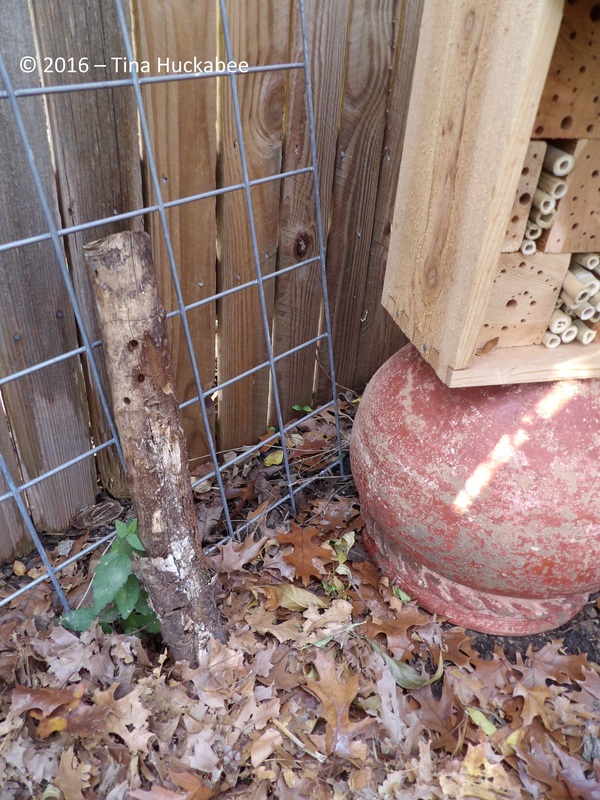 …that we (okay, Bee Daddy, not I) then drilled into cut, untreated wood. 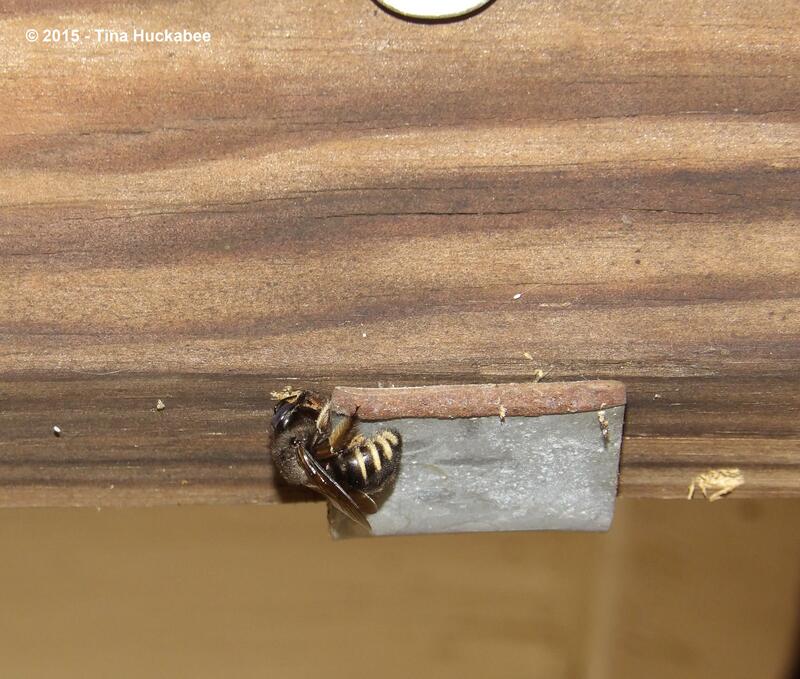 The wood doesn’t need to be expensive (Bee Daddy used inexpensive fence pickets and 2×4 boards), but it shouldn’t be treated with any chemicals. Remember, we’re trying to make nice homes for bees, not homes laden with icky, insect unfriendly chemicals. You want to drill a variety of circumference sizes as well as varying depths for the holes in order to attract different species of bees. Additionally, we (okay, Bee Daddy, not I), cut various sizes of bamboo (harvested from a friend’s home who was glad to share) to insert between the holey wood. Ta da!! A bee/insect hotel! Or townhouse! Or apartment! Or condominium! Or nesting box! 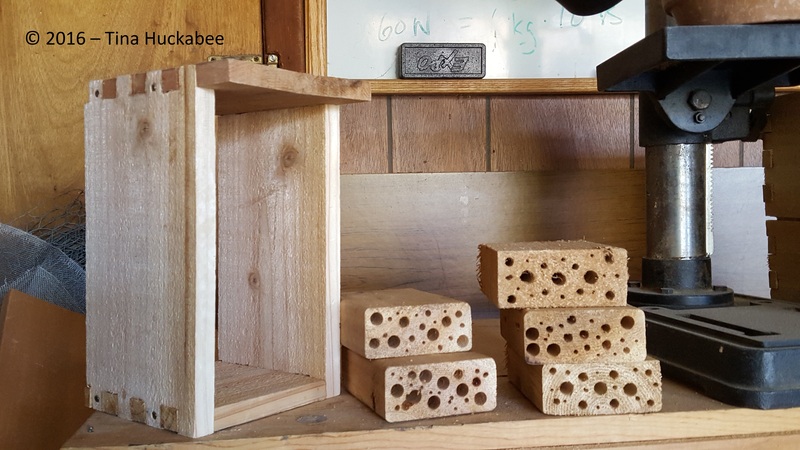 What this bee house really does is create something cute for gardeners to look at and safe for bees to nest in and nurture their offspring. 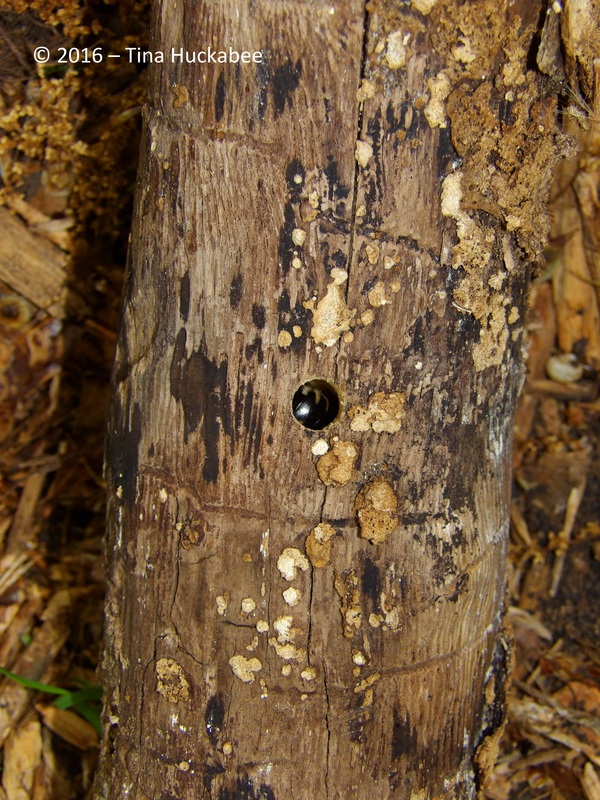 Native bees rest-n-nest in a variety of situations like the ground and natural cavities of wood or even rock. People-made insect hotels have become popular garden-art additions for those wild gardeners wanting to attract even wilder bees, as well as other important garden residents. I stacked the two insect hotels for “my” native bees, one on top of the other, with both popped atop an unused and upturned terracotta pot. Many insect hotels are free-standing and some are made to hang on fences or posts.The insect hotels can be as elaborate or as simple as your time and interests allow for. My bee condo is situated in a shady spot and both stories have a little overhang so that the entrances to the holes are somewhat protected from weather conditions. The different sized holes assure that bees of all kinds can find refuge for their young. Additionally, lizards and other insects will probably use this as a shelter and also to hunt critters who happen by. Don’t have a handy honey-do, carpenter-happy Bee Daddy to do the drill-baby-drill part of this project? That’s perfectly okay. 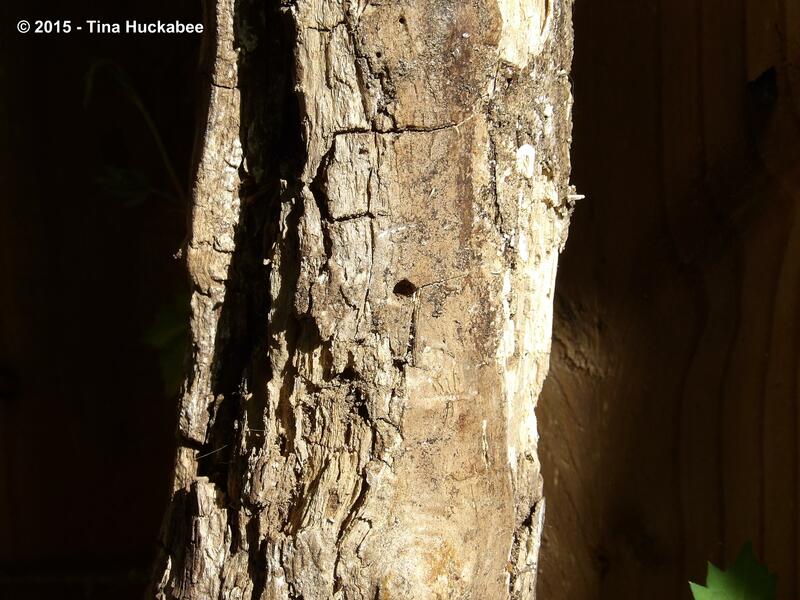 Aged firewood, or smaller, broken or trimmed tree limbs make great homes for native bees–and all you have to do is place these soon-to-be-bee homes in your garden and the bees will come. Can you see this little gal, squirreled away in her hidey-hole? 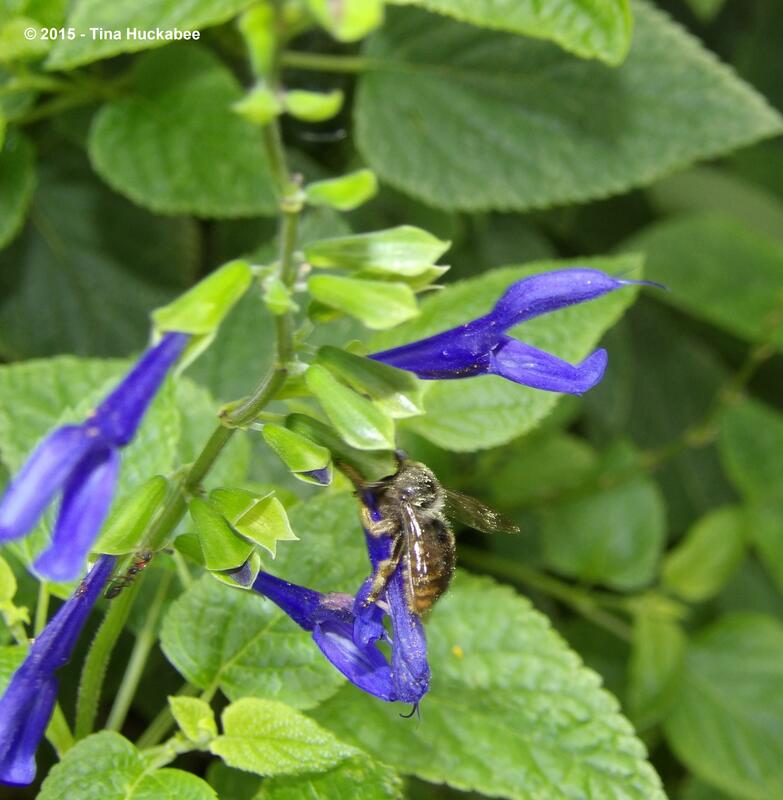 Available wood makes life easier for bees like this female Horsefly-like Carpenter bee, Xylocopa tabaniformis. . This mother-to-be drilled all afternoon one day last spring, only to abandon her nesting site. I hope she found softer wood here in which to lay her eggs. On my back patio, there are holes in the limestone rock that were drilled for shelves that we removed some years ago. 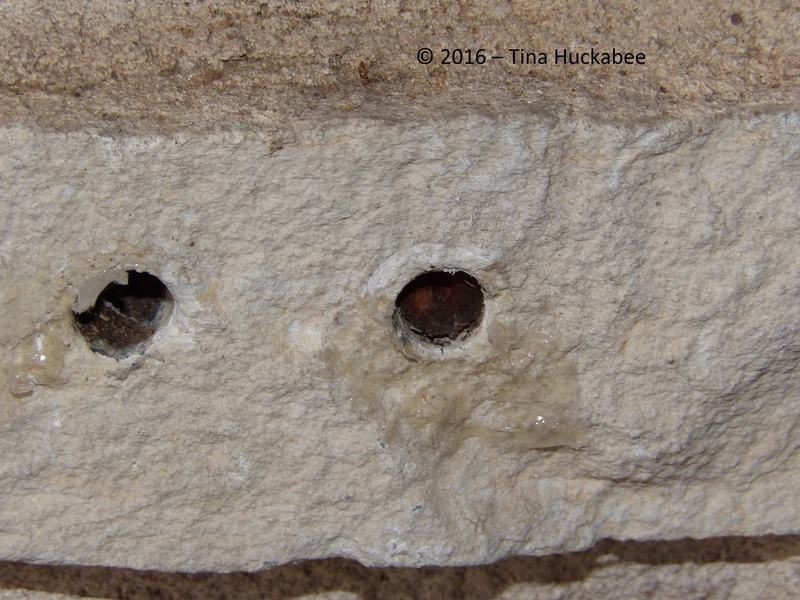 Instead of filling those holes with mortar, I’ve left them open and I’ve seen several species of bees use these holes as nurseries for their off-spring. Nice! I’m looking forward to viewing whomever emerges from that hole and who will be a pollinating fool all spring, summer, and fall. Along with setting out wood or building insect hotels, if there are fallen leaves from autumn, on the ground waiting for “someone” to pick them up–don’t! Or, at least, leave some leaves on the ground. Better yet, place that fallen foliage in your gardens. 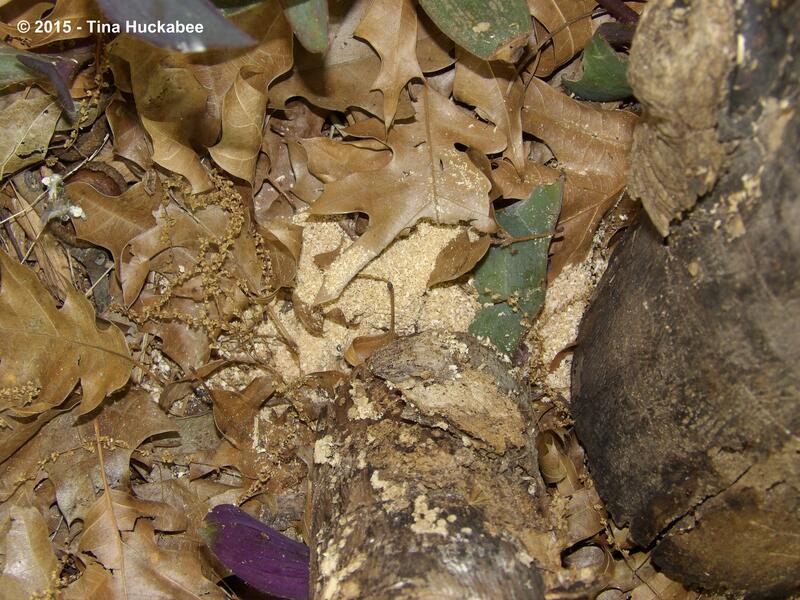 Many insects, including bees, take refuge in the cover that crinkly leaves and small tree limbs provide. Plus, the leaves don’t end up in the landfill and it’s less work for the gardener if the leaves aren’t bagged. “Less work” for the gardener is always a good thing. Lastly, don’t be shy about allowing some open dirt space in your habitat. There’s no garden rule that says every square inch of your property must be mulched, gardened, turfed, or hardscaped. About half of native bees are ground nesters and some of the most threatened native bees are those that need bare ground, either to over-winter in or to nest in. You’ll do everyone a favor if there’s a little naked dirt on your property, here and there. As of now there are no residents in our native bee houses. Because life gets in the way, it took us a while to complete this project: we made the templates last May, but we (okay, Bee Daddy, not I) finished the frames, bamboo cuts, and holes in November. I imagine there will be some residents in place by late spring this year. 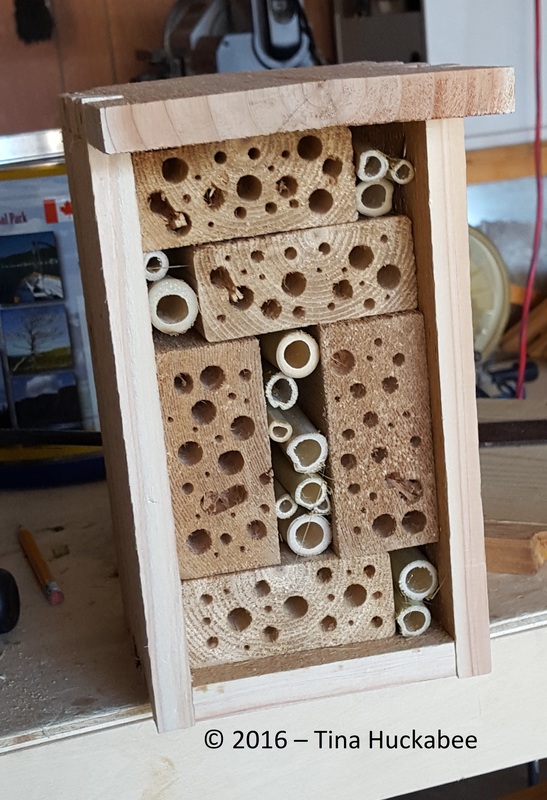 For more information about building your own native bee/insect house, check out this link from the Xerces Society for Invertebrate Conservation. 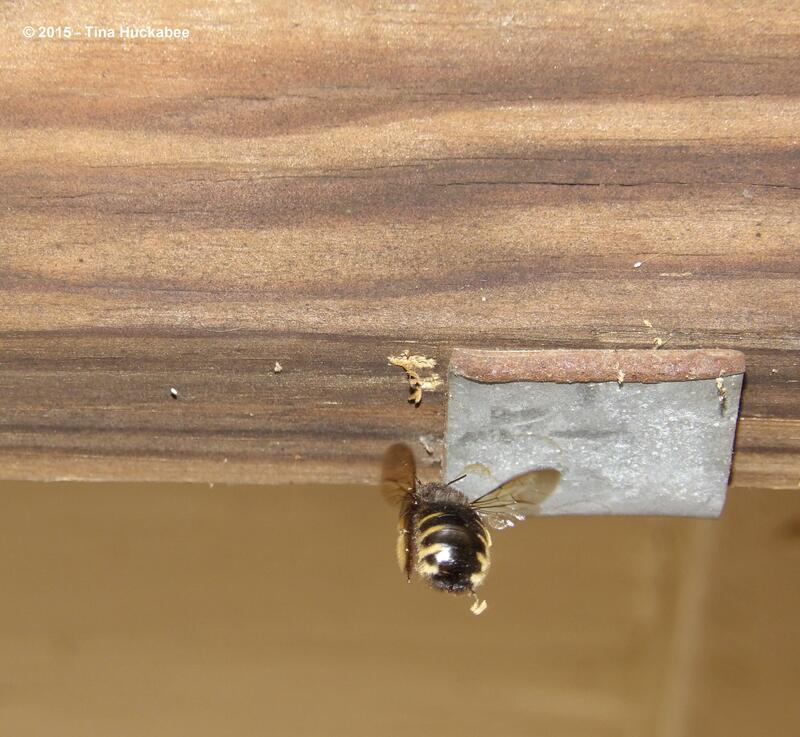 There are many Internet sites with information about native bees and how to make insect hotels. If you have children, this is an especially fun project in which to include them and teach the importance of nurturing wildlife and providing habitat. Don’t forget to plant gorgeous native plants for your bee buddies to nectar on. Lovely non-native bloomers also fit the bill and provide for pollinators. The world will be a better place for their survival because of your efforts. Did wildlife visit your garden this past month? Please post for February Wildlife Wednesday–share the rare or mundane, funny or fascinating, beneficial or harmful critters you encounter. When you comment on my post, please remember to leave a link to your Wildlife Wednesday post so readers can enjoy a variety of garden wildlife observations. 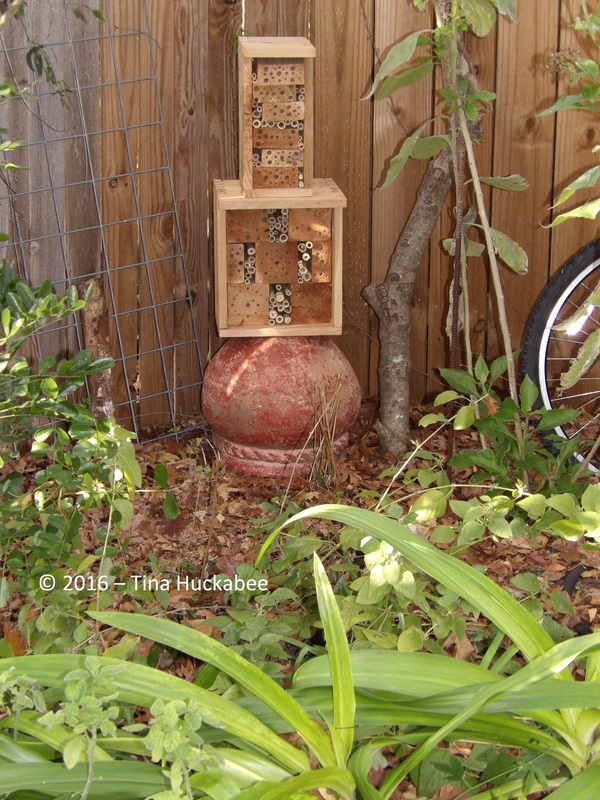 This entry was posted in Native Bees, Uncategorized, Wildlife Wednesday and tagged Bee Nesting Boxes, Insect Hotels by Tina. Bookmark the permalink. 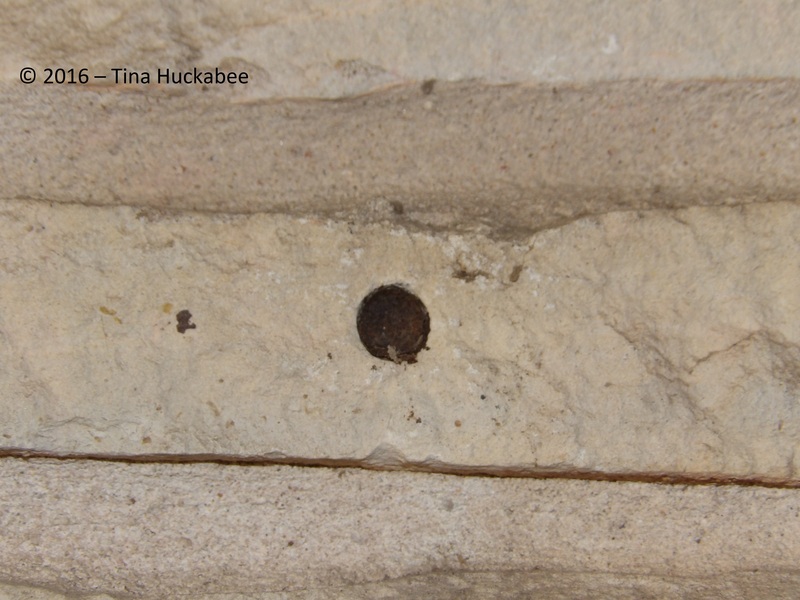 Hi Tina, lovely interesting post, although much milder than usual we have seen very few solitary bees this winter and have far fewer – around 250 species here than you. We have a bee house at home that I drilled the holes on, some are a bit wonky and random but I’m still practising! I have log piles for invertebrates but really like to use of old standing wood for bees too, that must of been an exciting discovery to see native bees at home in the old wood. Your wildlife visitors are fortunate to have found you, especially as you have carefully chosen so many native plants for their benefit. I have a short post to join in with your lovely meme, thanks as always for hosting. We’re also having a very mild winter–no real freeze at my place yet. I like your “wonky and random” description. I actually hate power tools, so I’m glad that Bee Daddy likes the noise and dust! I think it’s great that you keep logs and limbs for the bees–I imagine they (along with all your other garden critters) are happy to nest in your garden. I meant to add when I read your post earlier the research recently produced over here. Farmers have been encouraged to plant native hedges and wildflower margins, but its been discovered only 5-10% of pesticide sprayed on the crops remain, the other 90% leaches into the soil and is taken up by the wildflowers and hedgerow plants, making them considerably more toxic than the sprayed crops. Even more important until something is done about that to plant gardens for pollinators and wildlife. That’s certainly disheartening news, isn’t it? How big/active is your small family farm or organic farming community? That’s awesome! I hope they love it. We’ve (and by we, I mean my husband) have been putting the blooming citrus outside in their pots between cold nights do the native pollinators can partake. I ignorantly call them all mason bees, but I’m sure there are many types all masquerading as mason. I hope so too!! I’ll be your pollinators are enjoying the citrus blooms–I’d love to have a whiff of that gorgeous fragrance. You’re right about the number of native bee species. I’m making a concerted effort to learn the different species and found a good UT site that’s helped me with that. You call them generically “mason”, I call them “carpenter”. Funny! Hi Marian, thanks for stopping by! Our hotel is brand new, so for now, there aren’t any bees. I expect to have some though in the next couple of months. Fingers crossed. You always share such interesting and useful information. I’m excited to make a bee/insect home for our garden. Thanks, Tracy! 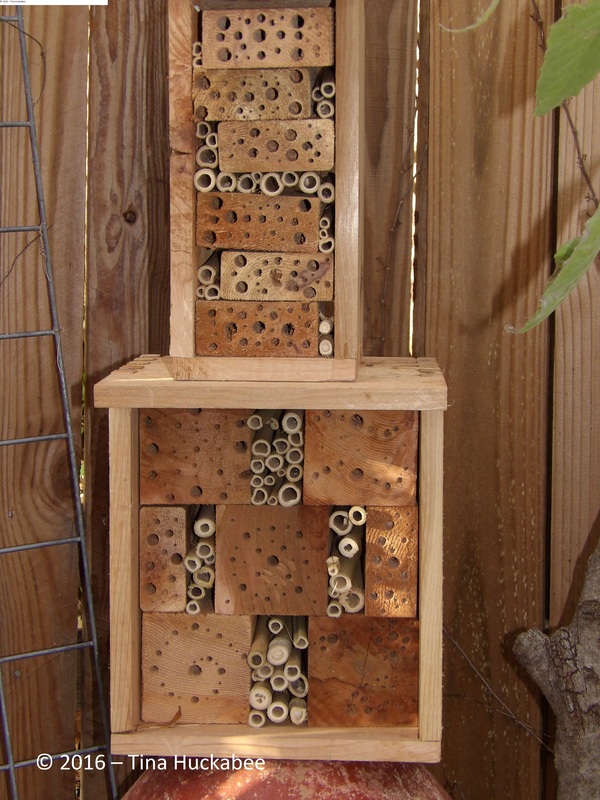 I hope you do make an insect house, but remember that it doesn’t have to be fancy or elaborate. Wood will do and then you can enjoy those beautiful pollinators in your garden. Truly inspirational, as always Tina! There is a pile of old wood laying close to the shed so I don’t have to worry for now, but is true that in all very tidy gardens there are few places for them to nest. Winter certainly has another meaning in your region 🙂 – it is so nice to still see something green and few insects flying around! Here it is my contribution, from our cold and gloomy winter. Luckily that we have the birds! Thanks so much! Yes, I can imagine that our winters differ just a bit from yours. This year is really mild and I’m not amused about that. I’m not really a fan of cold weather, but gosh, I shouldn’t be wearing shorts and t-shirts in January/early February. It’s cold here today, so that’s something. Thanks, Frances–he does and he enjoys the projects, or so he tells me. 🙂 Your post is an interesting and concerning one–that everyone should read. Thank you. 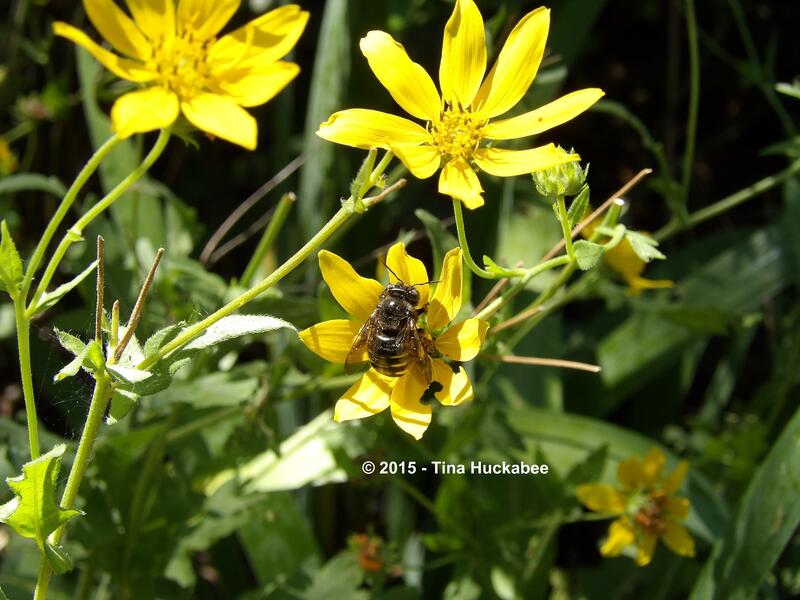 What wonderful photos of the pollinators! I’ve been contemplating adding a bee hotel, and perhaps I will one of these days–yours are delightful. Kudos to your partner. 😉 We have plentiful nesting spots for bees here, but the hotels are extra nice. My last post is from a location far from my garden, but seems appropriate for Wildlife Wednesday. Thanks for hosting! http://plantpostings.blogspot.com/2016/01/epiphytes-wildflowers-and-gators-at.html. Thank you, Beth. Bee Daddy is a good guy for this gardening girl to have. 🙂 The photos of the various bees were taking this past year. I have seen a Horsefly-like Carpenter bee pollinating a few times this winter, but mostly, they’re not around too much right now. Thanks for reading! I love the bee hotel. I don’t have one myself, but I make a point of leaving fallen tree branches in the back garden along with lots of leaf litter. Also, exciting about the sharp-shinned hawk! Thanks, Jason. Left out logs work just fine and dandy! The insect hotels are fun, but not really necessary. Isn’t it exciting about the hawk? I hope to catch a photo of him/her–a beauty! 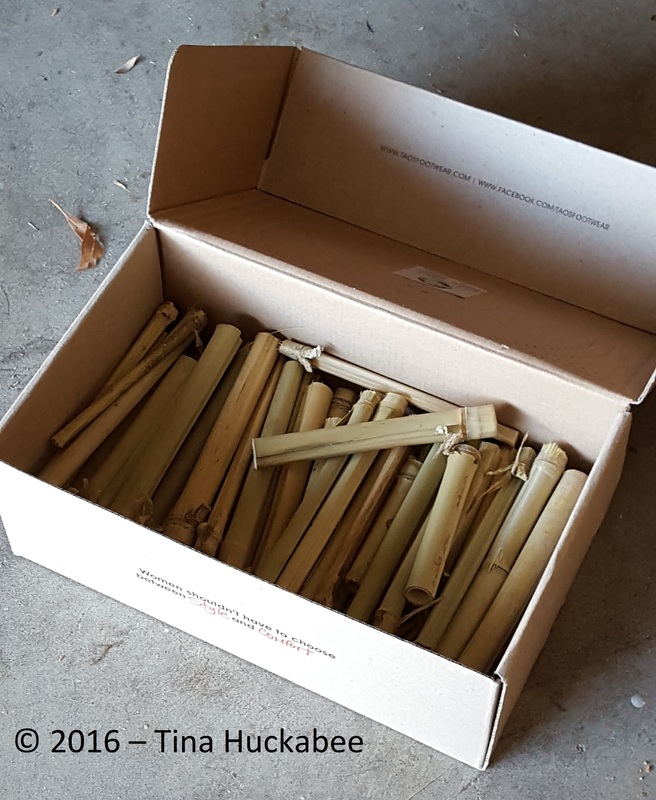 I have found your blog via Julie, you have given me an idea what to do with some of the bamboo cut out from the Garden, I will have to encourage the Grandchildren to help me create a bee hotel. Bees fascinate me, I use keep around 12 hives when I was younger and fitter! Hi Brian, thanks for stopping by! Yes indeed, you need to get those grandchildren out to help you. I think they’d enjoy the project and the results. And wow! I have two (well, sniff, only one) honeybee hive. I can’t imagine having 12. Very inspiring. Brilliant and beautiful. Well done to Bee Daddy and you! Thanks so much! It’s been fun and will be interesting to see if we get some insect interest in the new housing project. It’s great to hear that all the bits of trimmed wood we leave around for lizards and other wildlife will also attract native bees. I’m pretty sure we will give the wonderful bee house a try based on your example. Mr. Fox is the son of a master carpenter and needs little encouragement to run the power tools. Well get that son-of-a master-carpenter out to his workshop and have him get to sawing and cutting! I’m sure you’d enjoy the results and he’ll, no doubt, enjoy the building. 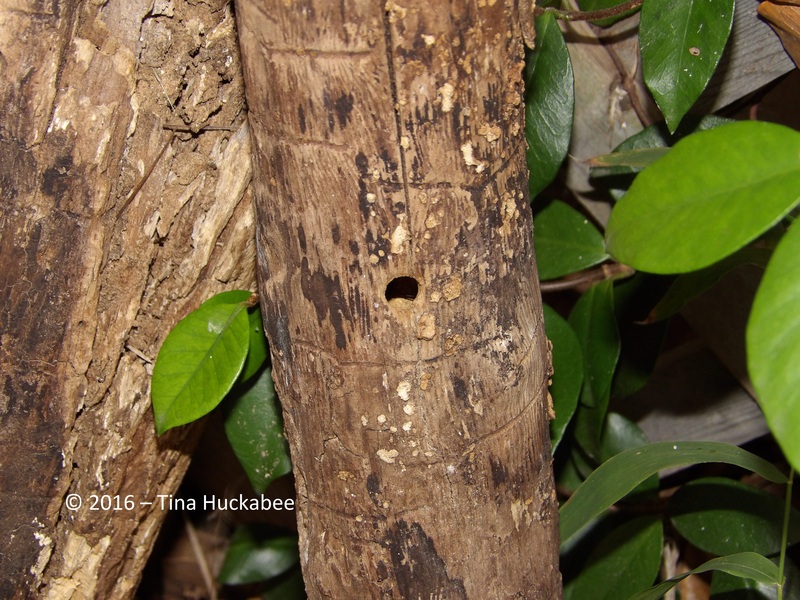 I adore my native bees and installed a bee hotel a few years ago…this past year we saw it 100% occupied. I love leaving old wood around like stumps…and leaves and bare dirt. Then these wonders easily share our space. Thanks for this terrific post reminding us of the native bees importance and how we can help them. That’s just fabulous! Wow–100% occupancy, I’m impressed!. You’re the envy of many an apartment complex manager. Great post. What an adorable bee hotel. Lucky tenants! I’m glad you emphasized the need to use untreated wood. Hopefully folks realize most construction wood scraps are treated. You absolutely have to find wood that has not been chemically preserved some way, so for this it might be best to buy wood (rather than recycling) that is labeled untreated just to be safe. 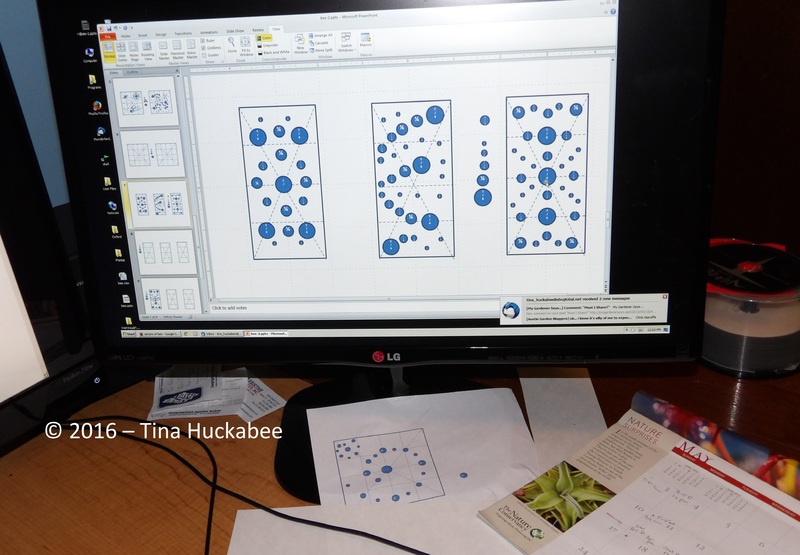 My sloppy habits and attempts to grow wildflowers from seed had already started drawing native bees in to our garden in ever growing numbers, because our beds include the relative rarity of open spaces with nothing but plant litter for cover. 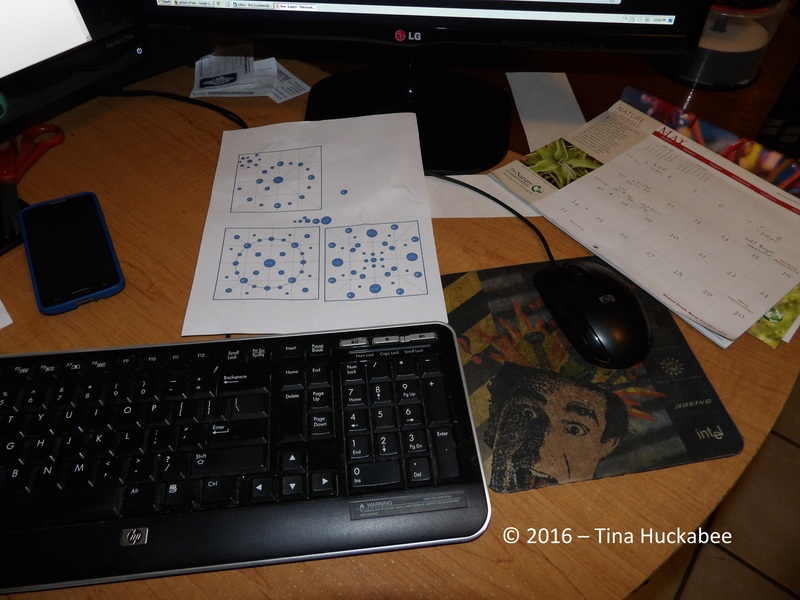 I’d originally thought I’d eventually get around to doing something organized with many of those areas, but after reading about the desperate shortage of such nesting spots for our natives, I decided to take a deep breath and let them be. Or….bee. At times it still bothers me that our beds can look pretty rough compared to most suburban lots, but most of the time I simply sit still long enough to notice the heightened activity of pollinators and other visitors, and I’m reminded why, and who, I’m truly gardening for. Thanks as always for leading the way! Pretty is as pretty does. I think the model of what constitutes an attractive garden needs to change, and thank goodness, is–albeit slowly. I know how much you’ve enjoyed your native wildflowers and that by growing those, you’ve seen an increase in native bees. And you’re right–we should be gardening for them, not some corporate vision of the beautiful American “yard”. Well, thanks, Ms. Fellow Bee Keeper! 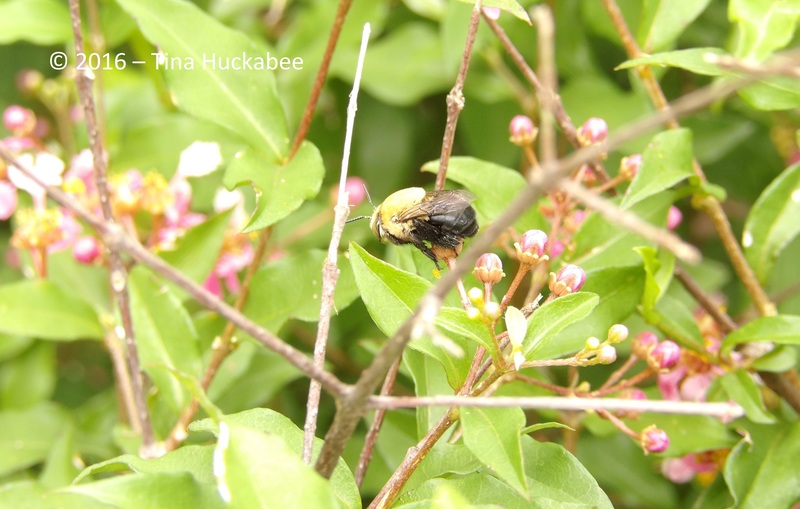 I’ve come to really enjoy watching and sometimes, identifying, those native bees–so many and I’m embarrassed to say that I wasn’t as aware of them in my early gardening years. The bird watching is fun. I’ll never be a get-up-at-3am-to-bird-watch-at 6am kind of birder. I enjoy my coffee way too much for that. But the little guys and gals that visit my immediate neck of the woods? I’m tickled to learn about them and notice them in other places that I might find myself. Awe–thanks. It was a fun project. So far, no residents, but it’s still early in the season. That’s great! The thing about these native bees is that they don’t need anything fancy–just wood, some bare soil and a bit of brambles–then, they do their thing for the world and we’re all richer for it! 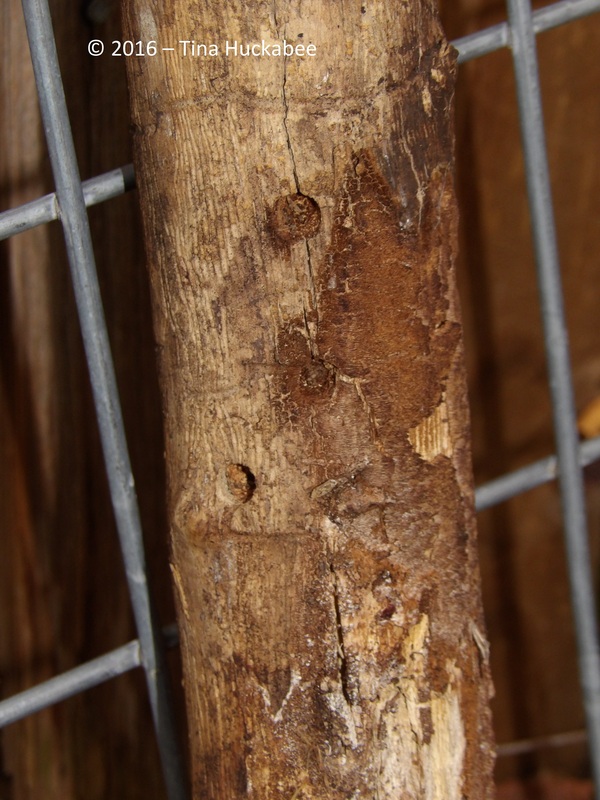 Have fun looking for an insect hotel!